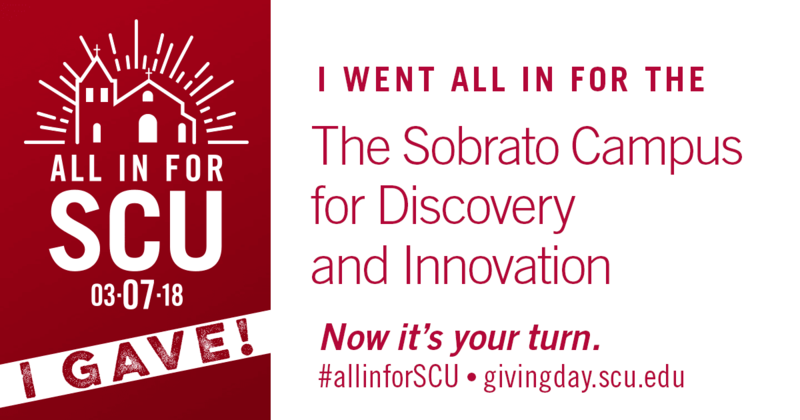 Sobrato Campus for Discovery and Innovation has raised $ 110,285 from 38 gifts! Transforming the Campus. Improving the World. THIS JUST IN: $100,000 DOLLAR FOR DOLLAR MATCH TODAY!!! ARE YOU ALL IN FOR THE SOBRATO CAMPUS FOR DISCOVERY AND INNOVATION? YOU can help build momentum for the causes you care most about by saving the image below and sharing it on your social media sites to show your Bronco pride! The Sobrato Campus for Discovery and Innovation will create opportunities for students to engage in innovative, high-impact, team-based projects. When complete, the Sobrato Campus will promote cross-disciplinary undergraduate teaching, research, and initiatives in areas such as neuroscience, bioengineering, sustainability, and environmental science. Santa Clara's bold plan for STEM education will position our students at the forefront of problem solving and discovery. Formed by the University's enduring Jesuit Catholic values and deep roots in, and connections to, Silicon Valley's vibrant ecosystem of innovation and entrepreneurship, there may be no institution of higher education better positioned to be the center of conscientious and responsible innovation in undergraduate education. All gifts made to the Sobrato Campus for Discovery and Innovation on the Day of Giving will be matched dollar-for-dollar, by an anonymous donor, up to $100,000.